I know we have one for our Mai Hime/Mai Otome merch, but I thought it would be appropriate to have a thread for this. I will post my collection in a little bit. :) We can also use this to talk about stuff we really want to get. Crayon Shin-chan Best of (I think... it's in Chinese) 3 vols. I'm really not sure about doing my figure collections... I'm not sure of the particulars with all of them. However, I do have some Marimite figures, some Lucky Star ones (just Minami), and the others are Fate/stay night. I do know I have the complete Fate/hollow ataraxia beach set and I think a complete set of the first trading arts series. Finally I have 2 Soul Eater figures of Patty and Liz... both are trading arts. I have a large Kululu figure with many many parts that I keep out as well. I also have a bunch of Digimon toys and things that are mostly junk cause they weren't stored right...I keep my two favorite digivices on display- Season 1 & Tamers. I sold all my others. I also have 3 mini Tamers figures I put out too. I have the mini Digimon that go with them, but I only bought them in the first place for the human figures, and mostly for Ruki. I got my dvds today, I will try to take pictures and upload them later. Alright posting some quick pictures of my purchases and some of my anime on the shelf(missing Princess Tutu from my shots since a friend is borrowing it). One volume of Kaichou Wa Maid-sama! Here's Part 1 of my collection, I'll get the rest up whenever it's possible. 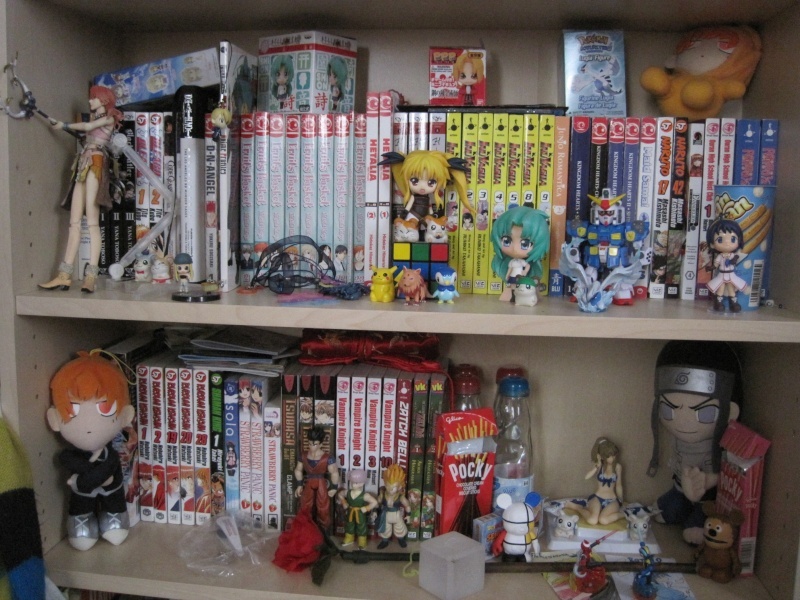 ^ Not my entire manga collection! This is about 1/4 of my collection on the shelf there. That's the TO-READ self with everything I'm planning to read. 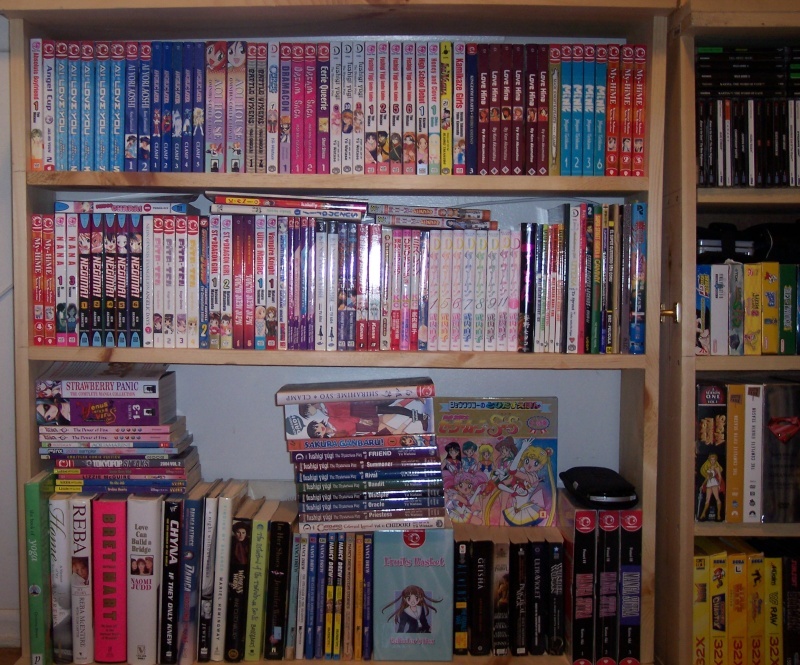 Some of the books are ones I proudly display in public like the Sailor Moon manga reprints. 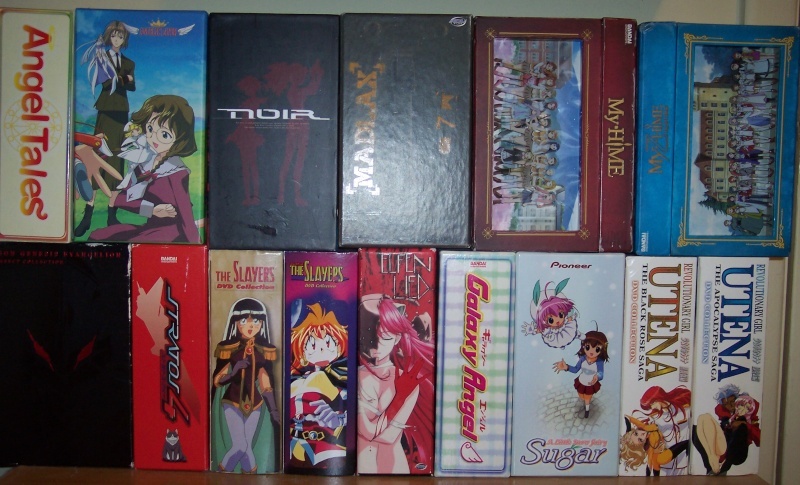 Nice collection Luu, I love your Fruits Basket, Slayers, Magic Knight Rayearth, Sailor Moon, and from what I can see lone Cardcaptor Sakura keychains. :) I have keychains coming in today or later this week. I will post pictures when I get them. Kyubey Mittens wrote: Nice collection Luu, I love your Fruits Basket, Slayers, Magic Knight Rayearth, Sailor Moon, and from what I can see lone Cardcaptor Sakura keychains. :) I have keychains coming in today or later this week. I will post pictures when I get them. I've added some more things! Chibi Rachy wrote: I've added some more things! We have threads for Noir and El Cazador de la Bruja. Have you watched either one yet? I'd love to discuss them with you, especially Noir. It's my 3rd favorite anime of all time. Luu Sky Sapphire wrote: We have threads for Noir and El Cazador de la Bruja. Have you watched either one yet? I'd love to discuss them with you, especially Noir. It's my 3rd favorite anime of all time. I have started watching Noir. I finished episode 3 tonight and will have the series finished by month's end. I'll soon have new Simoun stuff to post. I mentioned the poster and genga here, but I have one or two other things coming as well. I'm also contacting possible commissioners for my pilot costume and might have found a good one. We shall see. I don't think I'm cosplaying for Tekko. I feel so darned drained that just going will be nice. I will wear Simoun related gear instead. Well, at least two of the days. Chibi Rachy wrote: I'll soon have new Simoun stuff to post. I mentioned the poster and genga here, but I have one or two other things coming as well. I'm also contacting possible commissioners for my pilot costume and might have found a good one. We shall see. I don't think I'm cosplaying for Tekko. I feel so darned drained that just going will be nice. I will wear Simoun related gear instead. Well, at least two of the days. :o Cool! Keep us posted on the new Simoun items. Is this commissioner charging decent prices by any chance? Luu Sky Sapphire wrote: :o Cool! Keep us posted on the new Simoun items. Is this commissioner charging decent prices by any chance? Oh I definitely will :) The last two are on their way so soon. And no, the commissioner is not cheap, but from my research she has very high quality work, and I can't afford for this project to be screwed up. If it's Aaeru, I will pay for quality. Chibi Rachy wrote: If it's Aaeru, I will pay for quality. 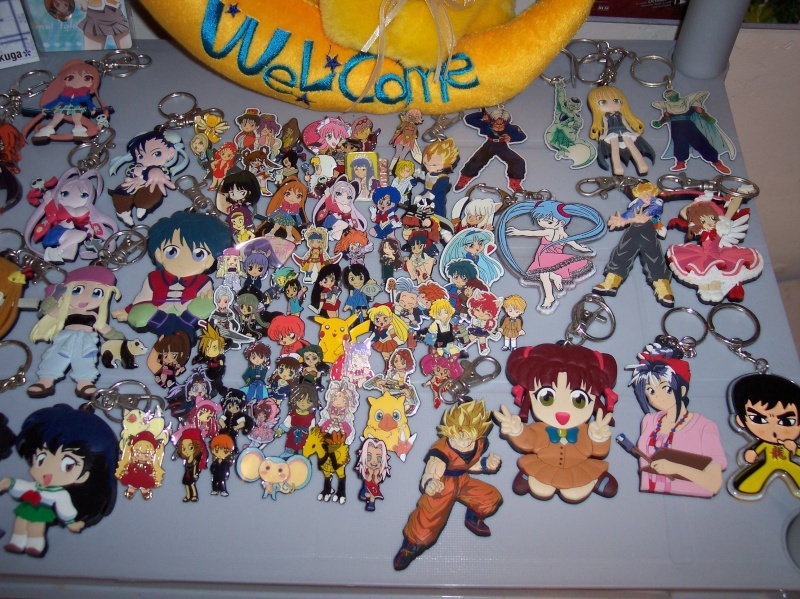 I will post all my keychains from Bakemonogatari in a little while but I figure I would post all the merch I got from the con I went to recently, got quite a bit. Kagami(Lucky Star) pin, Fruits Basket keychain, Sgt Frog keychain, my new wallet. Sengoku, Hitagi, and Mayoi keychains(Well I only the Hitagi one at the con but these guys were on my backpack all week). Myself with my Artemis hat(with a Heartcatch Precure pin), and cards for Ume and Fuu from Magic Knight Rayearth. Oh yeah the shirt I had on I won from a lottery thing at the con, has signatures from Wendee Lee and some of the other speakers. Impressive collection, Juke! The Sailor Moon Sailor Stars wallscroll is uber win. XD The Sgt Frog wallet is priceless. 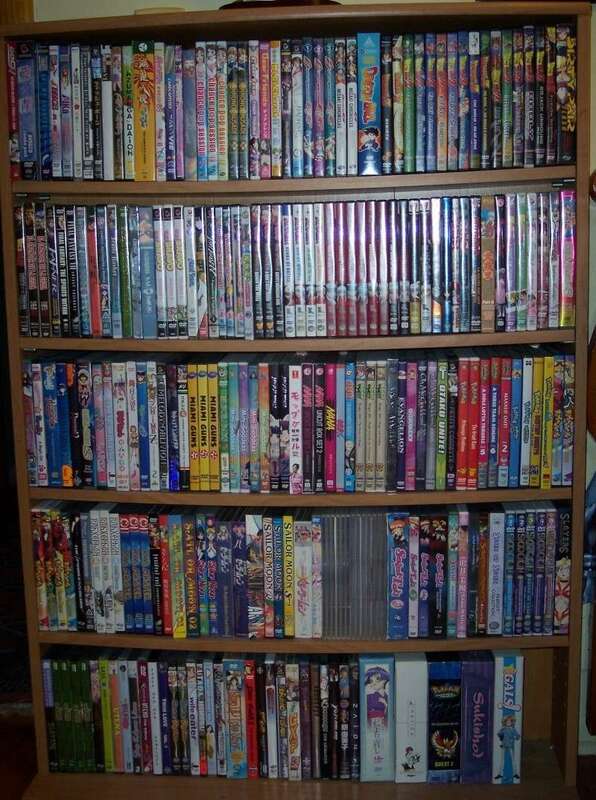 I'll be uploading anime DVD collection tonight. 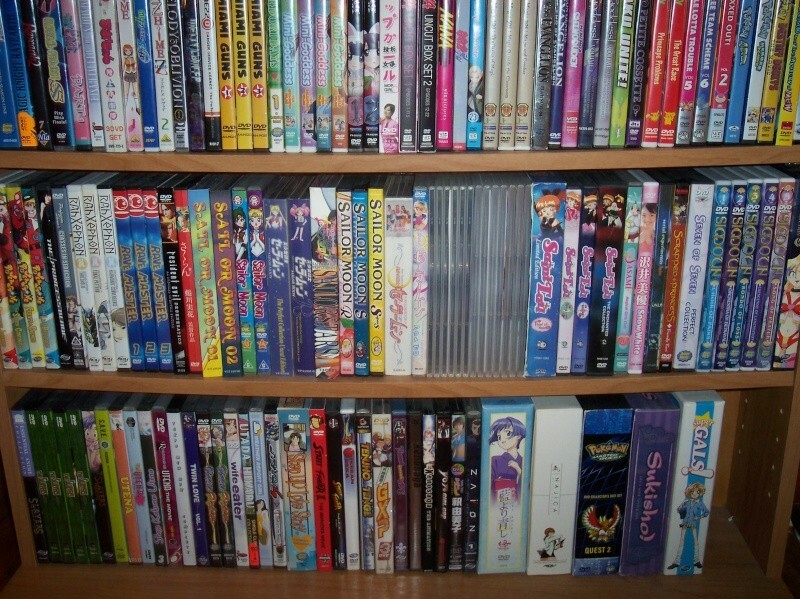 Sweet collection, Luu, I only wish I could pick out some of the harder to see titles. I will post my budding shelve of anime stuff once I can get my Black Rock Shooter figurine set up how I want it. Kyubey Mittens wrote: Sweet collection, Luu, I only wish I could pick out some of the harder to see titles. I will post my budding shelve of anime stuff once I can get my Black Rock Shooter figurine set up how I want it. XD Yeah, I'm obviously not the best photographer. I'm curious about your upcoming photo shoot! :) I think I'll tackle my artbooks and doujinshi next. 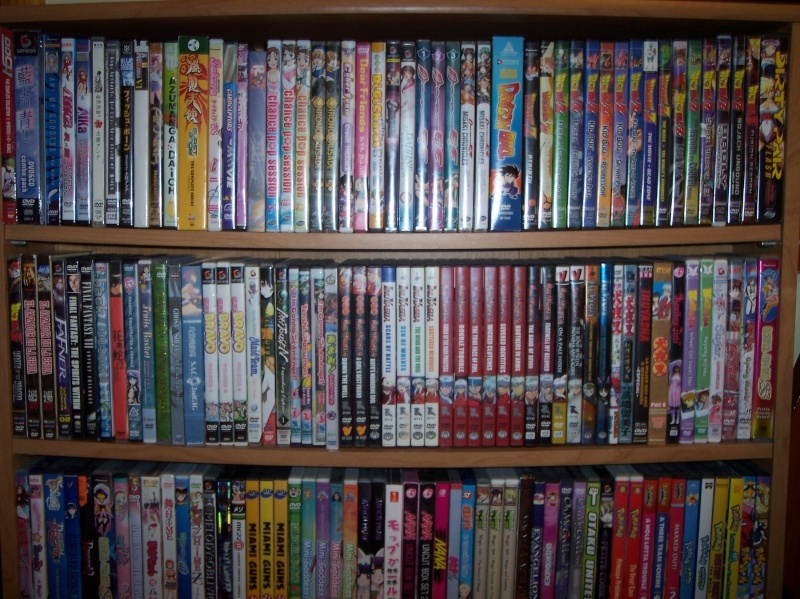 Here is my dvd shelf(won't be taking many pictures again until it doubles in size). 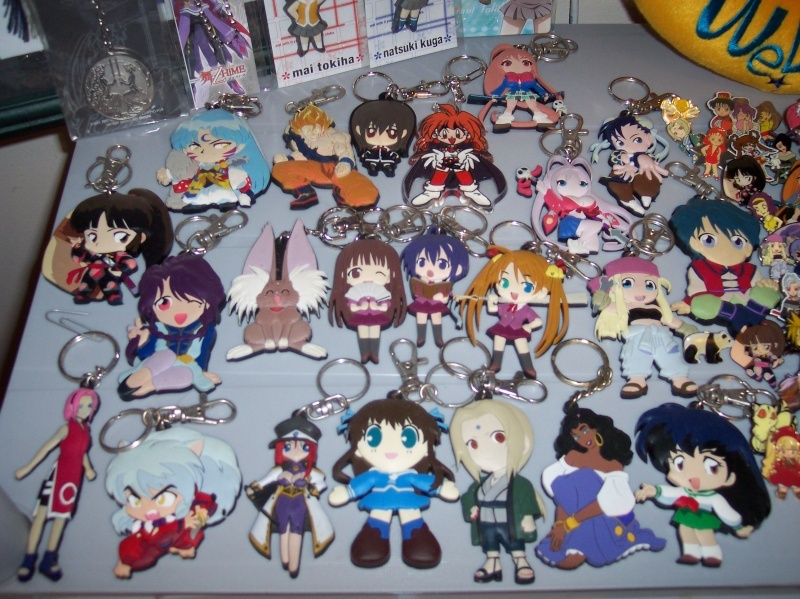 Also here are all my Bakemonogatari keychains, including the one I got at the con.